In this post, you will find all the information and materials list for the Farm Blanket Crochet Along! I’m so excited you’re here and I can’t wait to crochet along with you! 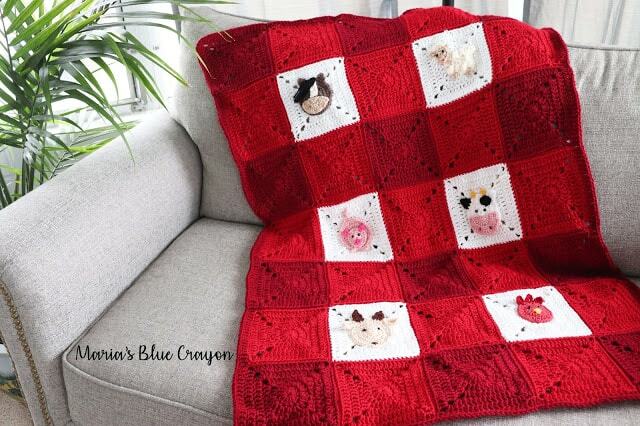 So first thing’s first, is this Farm Blanket Crochet Along free or paid? When will the Crochet Along start? The Crochet Along for the Farm Blanket will begin Sunday January 27th and run until March 10th for a total of 7 weeks. Yes! I used I Love This Yarn! from Hobby Lobby, but I know it is not accessible to everyone so I have a few suggestions as far as yarn substitutions. I Love This Yarn! is a worsted weight yarn, but I would say it’s more on the thicker end as far as worsted weighted yarns go. The yarns I recommend as substituions are Red Heart Super Saver, Lion Brand Vanna’s Choice, or Loops and Threads Impeccable (from Michael’s). Can I use DK yarn? I know many people asked about using DK yarn a few years ago for the Christmas Granny Square Afghan. 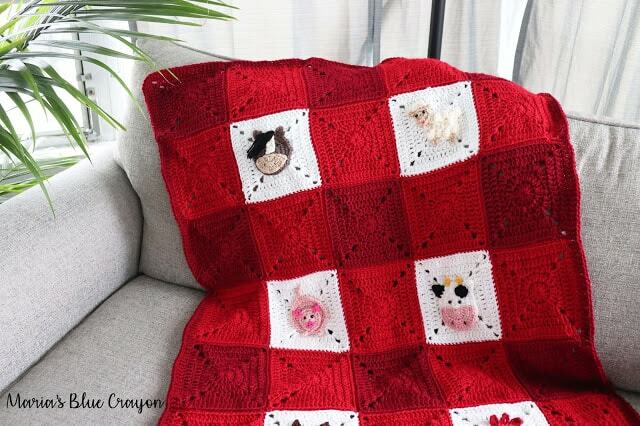 My suggestion to you is, if you use DK yarn you will either want to make your granny squares larger by one row (which can easily be done) or add a whole other row to the blanket. What are the dimensions of the blanket? There will be TWO size options for this blanket. I made a smaller baby/toddler sized blanket for my son but I was mindful that some may want a larger blanket for their sofa. The baby size option is 35″ x 49″. The throw size option is 63″ x 49″. Get to the main post of the Farm Blanket here. 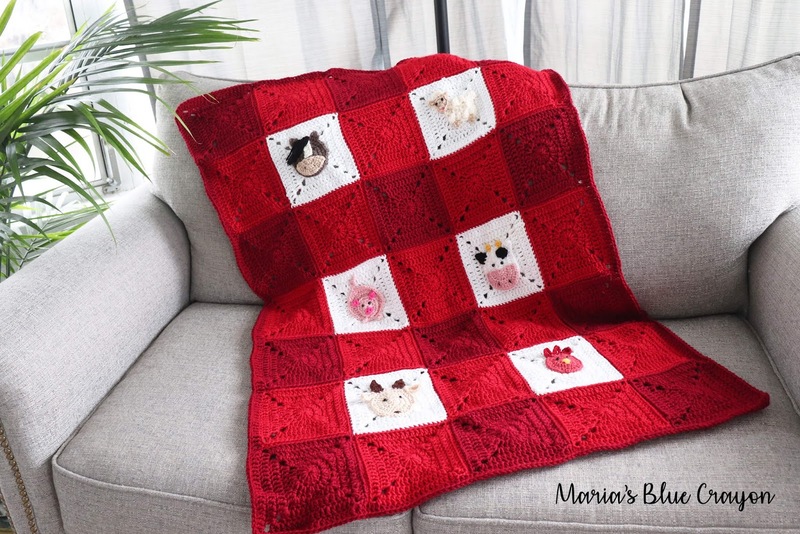 This blanket will consist of granny squares and appliques sewn on. If you are a newbie to joining and sewing on appliques, I have videos that will help you along the way! I will also have video tutorials along with the written patterns for each and every applique (as well as the granny square). If you’d like to get weekly reminders when each part of the crochet along comes out (I know social media doesn’t always do a good job of notifying everyone of new posts) you can sign up for my email list! I also send out an email each time I release a new pattern (you can unsubscribe at any time). Sign up here. I will be releasing each part every Sunday 9am (EST). Lastly, be sure to join the Maria’s Yarn Friend Facebook group so you can share your progress, ask questions, and share anything yarn related!